It is by far the solar system's largest planet - all the others could fit inside it twice over. It has the fastest rotation of all the planets - just under 10 hours. it has several weird features, which we'll explore here. This is perhaps the most famous feature of Jupiter. Located in its southern hemisphere, it is a huge, violent storm that has been raging for centuries. It has certainly been observed since 1831, but the famous astronomer, Cassini, mentions a "permanent spot" on Jupiter as early as 1665. It is huge, being up to 25,000 miles wide and over 8,000 miles high. To put this into perspective, three planet Earths could be placed side-by-side within it. Now, you'd think that a storm this big that's raged for centuries would be enough to qualify towards the weirdness of Jupiter, but there's more to it. Since it was first observed, it has stayed put, fixed in place. You'd think a storm would move about a bit, wouldn't you? Weird! 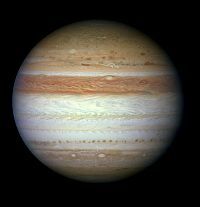 Although, in the above image, the Great Red Spot appears more a dirty brown than red, it varies in colour from the one you see above to vivid red, then even becoming almost white. Nobody has any idea why this is. 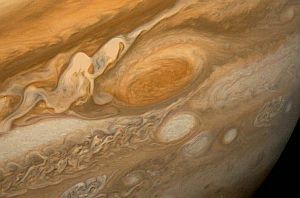 If you check out the image again, you'll see, below the Great Red Spot, a smaller spot, which has been christened the "Little Red Spot", or "Red Spot Jr". This was formed by the merging of three smaller spots, during the years 1998-2000 and its official name is the less inspiring Oval BA. At the time of its formation, it was white in colour. In 2005, it began to turn red, to match its big brother. Yet again, the reason for this is unknown. 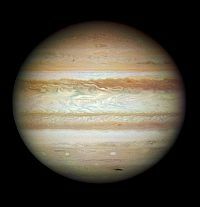 Anyone who's seen an image of Jupiter will know that it's striped. These bands are alternating light and dark. The light ones are officially called "zones", while the darker ones are "belts". What's weird about them is that they're not permanent. Sometimes they just disappear! It is thought that these belts and zones are caused by jet streams, but the mechanism behind them, based on the properties they exhibit, is still a subject of debate, as is their colour. So, though a reasonably familiar planet, Jupiter still has more than its fair share of weirdness!